So, you want to post some video content to your Facebook page? There is no denying that video content is an excellent form of online marketing, but the truth of the matter is, video marketing on Facebook has recently changed their algorithm. Due to these changes, it is now more important than ever to understand how to not only to use Facebook Live but why this is a better alternative than posting a traditional video. So many people today are talking about Facebook Live and all that it can offer. However, if you have never tried this latest and greatest social media feature, it can seem confusing and overwhelming to say the least. However, the good news is, it is relatively simple to do and no more difficult than recording and posting a traditional video. The only difference is that on average, a Facebook Live video is going to have a 35% higher reach than a traditional uploaded video. According to one study, a Facebook Live Video had, on average about 75% more shares than photos or uploaded videos, all without putting much more time into the process. Interested in trying it out for yourself? Here are a few facts about Facebook Live videos that may just convince you to do one for yourself. You can engage followers for a longer period of time. This is perhaps the biggest difference between Facebook live and standard videos. Engagement is by far the most important part of online marketing and the longer you can keep your followers engaged the better. Viewers can respond directly to you. As your viewers watch your Facebook Live video, they can respond directly to you through the platform. You want to be able to create a rapport with your followers on social media. Facebook Live videos get ten times the number of comments than recorded videos. This is just one indication of how much more people tend to watch and engage with Facebook Live videos over traditional video posts while they’re on the site. However, this doesn’t mean that you should disregard traditional videos all together. It is always great to mix it up when it comes to creating social media content. However, Facebook Live should be part of your current rotating content plan. So, next time you are looking to bring new video content to your followers, forget posting a standard video and give Facebook Live a try. 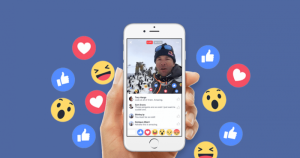 Here at Life in Motion, we can help you come up with new ideas for your Facebook Live videos and help you gain a better understanding of how they can be integrated into your current marketing plan. We are here to help with all of your online marketing endeavors, including your use of Facebook Live.